One of my goals for 2013 was to read at least one new book a month–which I’m happy to report I did! While taking a look back at what I read, I noted that my first three books of the year were all memoirs. Wael Ghonim’s “Revolution 2.0” charts how he utilized social media to play a major role in the 2011 Tahrir Square protest movement in Egypt. In “Breaking Up With God,” Sarah Sentilles discusses faith, theology, and her ordination process to become an Episcopal priest. The third memoir was “Fresh Off the Boat” by Eddie Huang. It’s the story of Eddie’s life–how he grew up, and went from being a drug dealing thug to lawyer to streetwear mogul to Food Network cooking show competitor to restaurant owner. It’s Friday, which means that people will be plotting all day where to meet their friends for happy hour. Last year I wrote about some of my favorite happy hours, and there’s one more I definitely need to add to the list. It’s the pizza happy hour at Serious Pie, Tom Douglas’s gourmet take on a pizzeria. Happy hour is early (3:00-5:00 p.m.) and short, but if you can make it during this window, you should. It can be virtually impossible to score a seat in Serious Pie during lunch or dinner. Full-size pizza are usually around $17, but during happy hour, you can order mini pies for just $5. Happy hour beer is $3 and wine is $5. Last week my friend Sharon and I were shopping downtown one afternoon and ducked into Serious Pie for a hearty snack and to escape an impending rainstorm. 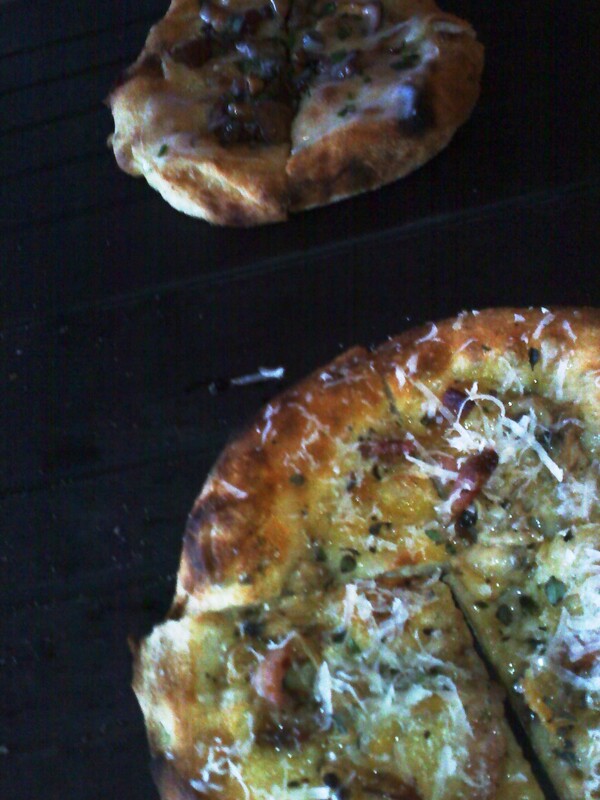 Pizza toppings run the gamut from basic (mozzarella and tomato) to full-blown foodie (guanciale, soft egg and arugula). We ordered two mini pies to share: the chanterelle mushroom and truffle cheese and one with Penn Cove clams, pancetta and lemon thyme. The clam and pancetta pizza is a salty snack lover’s dream, while the mushroom and the other pie had a sweet and mellow flavor with just a hint of truffle. The pizza at Serious Pie is soft and pillowy (no cracker-thin crust here!) making the top-notch ingredients taste that much more luxurious.